Welcome one and all to the latest installment of the NXT Spotlight here at TJRWrestling. We are back in Full Sail after a very successful venture to New Orleans for WrestleMania weekend for the brand of NXT. Some are calling Takeover: New Orleans (read my review here) the best ever, and it’s hard to argue that. Dave Meltzer gave two of the five matches 5 stars, and another was just over 4 stars (John Canton’s star ratings were also very high for the show). The brand has never been hotter than it is right now in my opinion. Last week was a lot of recap for that show, so I took the week off, but I do want to make note that the tag team formerly known as War Machine debuted last week as the War Raiders. They kept their names for the most part as they will be known as Rowe and Hanson and obviously War Raiders is close to War Machine, so I think it’s a win for everyone. They destroyed Heavy Machinery and Sabbatelli/Moss in a tag match that never really got underway. With Sanity and AOP going to the main roster, that’s a big hole that someone like War Raiders need to fill. I’m a big fan of the team and hope for big things for them. With all that being said, let’s get to this week’s action! Gargano comes out to a hero’s welcome alongside his wife, Candice LaRae. He starts his promo by saying he dreamed of this moment heading into Takeover. His career had been defined by two words, Tommaso Ciampa. He ruined his life and his career. Ciampa haunted him every day. After 37 minutes of the most intense action he’s ever had in the ring, he can now say he has his life back and he’s back where he belongs. He says thinking about everything the fans did, holding up his signs and chanting his name, he says thank you for always having his back. To his wife, he knows these last few months have been tough on them but he wouldn’t have been able to do it without her. Now that we’re past the mushy stuff, and Johnny Wrestling along with Candice Wrestling have some unfinished business in NXT. Candice takes the mic and says that’s accurate and she’s going to finish it tonight as she takes on Zelina Vega. Johnny says that if Andrade tries to get involved, he’ll drop Almas like he’s Tommaso Ciampa. Johnny says after he’s done with Almas, since we have a new NXT Champion, you’re looking at his first challenger. Because he is Johnny Wrestling and we are NXT. K-Tank’s Take: Solid promo as always from Gargano. I think it’s only right for him to go into a title picture again as it’s the one thing he has left to do and the story of him coming so close, has been really well done. I wouldn’t be surprised to see the next Takeover have a Triple Threat main event between these two and Ciampa. We get a promo from outside the arena with Killian Dain who talks about his match with Lars Sullivan tonight. He says he’s going to bring the chaos to Lars. Really cool entrance for Ricochet with lasers and smoke. Ricochet with his athleticism early, catches Aichner with his handstand headscissors and then a nice dropkick. Aichner manages to catch a leap frog attempt on Ricochet and turns it into a massive gutbuster. They fight back and forth in the corner but Aichner sends Ricochet into the ropes and catches him with a tilt-a-whirl backbreaker. Aichner now locks on a bearhug on the mat. Aichner tries a powerbomb but Ricochet escapes. Ricochet with a somersault dropkick out of the corner to get the advantage. Ricochet with a 619 and then a springboard European uppercut. Follows that with a standing shooting star press but Aichner kicks out of the pin. Ricochet to the top rope but Aichner cuts him off. Ricochet manages to block a superplex attempt and then knocks him off with a right hand. Ricochet sets up and nails the incredible 630 splash and gets the win. Post match, Ricochet is interviewed outside the ring and is asked how it feels to make his debut in NXT. He says it feels great. He’s seen a lot of superstars make their name here in Full Sail. Now it’s his turn. 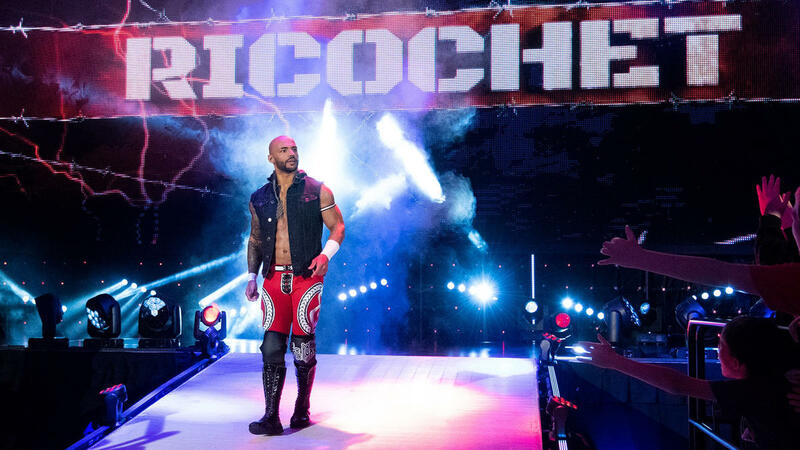 He came to NXT to turn it up a notch and to prove to the entire NXT universe why there is just one and only Ricochet. K-Tank’s Take: It’s still somewhat surreal to see Ricochet in NXT. His athleticism is on another level. He is so much fun to watch. I’d love to see his social media battles with Velveteen Dream continue to an angle here on NXT TV. We get a vignette for EC3, followed by a Lars Sullivan promo to follow Killian Dain’s promo from earlier to promote their match. JC and Chris are Deuce & Domino 2018 that have been on NXT before. Rowe starts right away with a massive running double knee to let’s say JC. Chris reluctantly tags in and gets a judo toss for his troubles. Hanson tags in and drills a knee into the ribs. Chris tries to chop Hanson to know effect and Hanson does a cartwheel into a dropkick. Rowe tags in and they land a double team pop up powerslam. JC is back in and is quickly disposed of. Hanson right back in and go for their back suplex/top rope legdrop finisher, which it sounds like Mauro called The Fallout, and that picks up a decisive win. K-Tank’s Take: Not much more to say than what I put in the opening paragraph. They looked fantastic here and very much War Machine in everything they did. 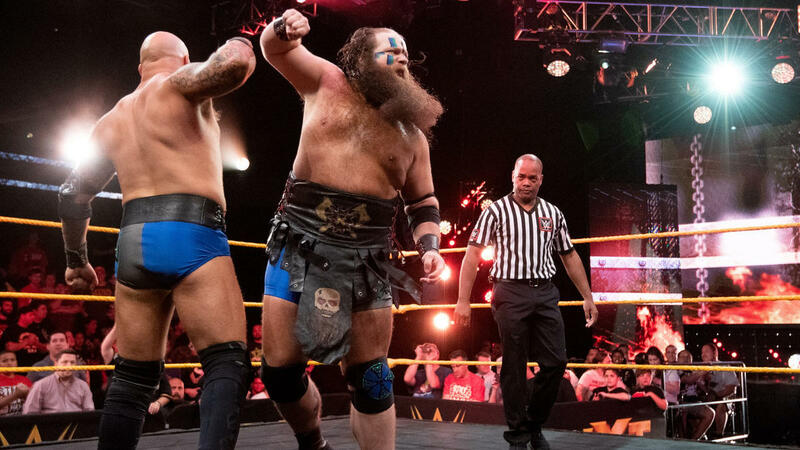 They should be a force in NXT. We go to earlier this week at the PC, where Shayna Baszler says she’s late for a meeting but she’s never followed rules and won’t now. She walks into the women’s locker room where Serena Deeb is having a group meeting. Shayna goes right to Ember’s locker and removes her name from it and puts a queen of spades card in it’s place. She challenges all of the women’s locker room to do something about her being champion. Dakota Kai walks out of the meeting to Shayna’s amusement. Kona Reeves is apparently being repackaged and is being billed as “NXT’s Finest”. He’s coming in two weeks. It looks like some sort of male model gimmick. We go to earlier today where Pete Dunne is leaving the arena and is asked about his thoughts on Roderick Strong. He says he’ll be back in a couple weeks and if you want to know what his thoughts are, wait until then when he rips Strong’s arm off. Dain immediately with a headbutt. Big blows by both men until Dain clotheslines Lars over the top rope. Lars lands on his feet and pulls Dain out with him. Sullivan ends up getting sent into the steel steps. Dain gets back in the ring so he can dive through the ropes onto Lars, but Lars catches him and sends him into the ringpost instead. Lars then suplexes Dain on the floor. Both men back in the ring and Lars with multiple cross face shots to Dain. Lars somehow deadlifts Dain into a German suplex. Dain ends up landing on his stomach instead of his back, but it was still impressive. Dain goes to the floor and Lars decides to go to the top rope and nails a clothesline on Dain. Back in the ring again and Lars goes to the second rope and lands a diving headbutt. Dain is now bleeding from the nose. Lars goes under the ring and starts tossing steel chairs into the ring. Lars attacks Dain with one but Dain fights back and lands a running front dropkick. Both men go back to trading blows back and forth. Dain ducks a shot though and lands Wasteland, followed by a running senton, followed by a Vader bomb. Lars kicks out. Now it’s Dain going under the ring and he pulls out a table. Dain drives a chair into the kidneys of Lars and then props the table up in one of the corners. A chair shot across the back and then tries to follow up, but Lars counters and lands a back suplex. Lars lays a chair across Dain and then goes to the top rope, but Dain rolls out of the way and leaves the chair in Lars’ path, who headbutts it on his way down. Dain tries to hit a running cross body through the table but Lars catches him and lands a World’s Strongest Slam. Dain kicks out at one though and then gets right up and this time is able to drive Lars through the table with his cross body. Dain puts a chair on Lars and stomps away at him in the corner. Dain now looks like he wants to land Coast to Coast with the chair set up on Lars. Lars gets up with the chair, but Dain just punches it right in Lars’ face. Lars recovers quickly though and nails Dain with the chair. Lars sets ups two chairs on top of each other and manages to get Dain up for the Freak Accident, right on the chairs, and Lars picks up a big win. K-Tank’s Take: Obviously with Sanity being called up to Smackdown, this result makes sense to help Sullivan look strong. I have issues with Sanity being called up without Nikki Cross, but I can address that at another time. This was a really hard hitting match and both guys have a ton of potential in their respective brands. We go to a video package where we recap Johnny Gargano’s issues with Andrade Almas and Zelina Vega, and how his wife Candice LaRae came into the picture. Next week will be Undisputed Era loaded as all three members will be in action. Adam Cole will take on Oney Lorcan for the North American Title. Not much time left in the show, so not much of a main event. Candice shoves Zelina down and then lands a gutbuster. Just like that, Almas comes through the crowd to distract Candice as she goes to the top rope. Zelina knocks her off and sends her to the floor as Johnny Gargano is now out to even the sides. Zelina gets Candice back in the ring and goes for a pin but Candice kicks out. Zelina with a dragon sleeper of sorts but Candice drives her into the turnbuckles and gets out. Zelina lands a big kick in the corner and then hits Almas’ running double knees, but Candice kicks out. Zelina now wants the Hammerlock DDT but Candice turns into a small package. Zelina kicks out. Candice is all over Zelina in the corner and then goes to the top rope and lands a great missile dropkick. Zelina manages to kick out. 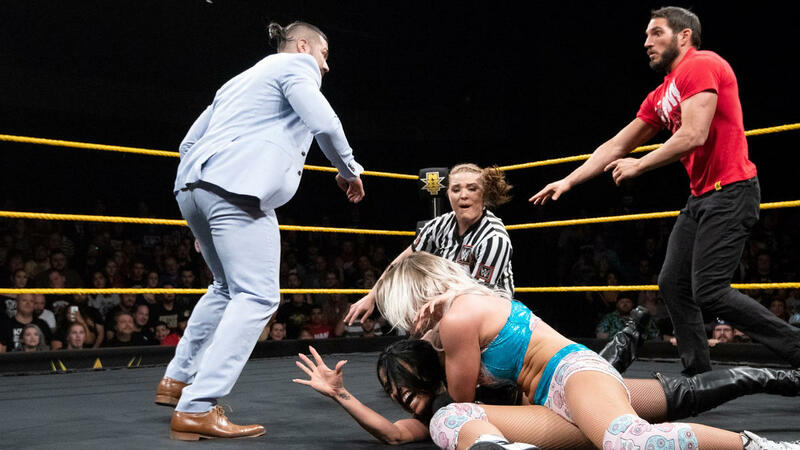 Candice connects with the headscissors into the Gargano Escape, which leads Almas to get in the ring. Gargano cuts him off and it’s a husband and wife Gargano Escape combo. Zelina taps out! Post match, Gargano grabs a mic and tells his wife that that was awesome. He says that they now have one last piece of business after taking care of Vega and Almas. 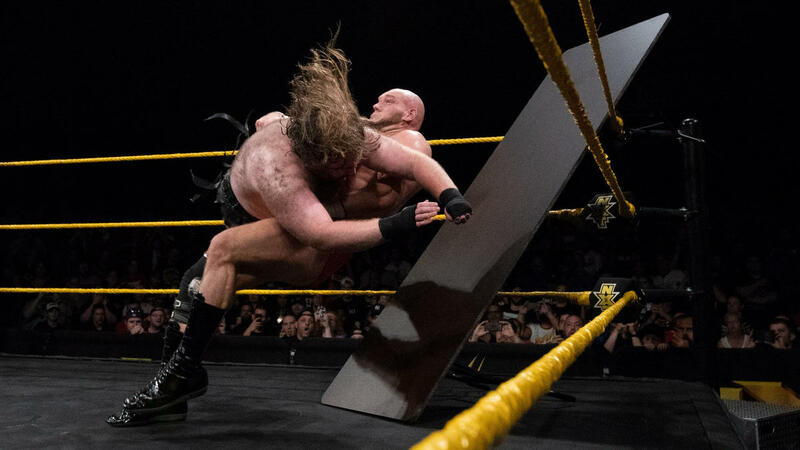 He’s challenging Aleister Black for the NXT Championship. Black’s music hits immediately and here comes the champ. Black says that if Gargano wants it, next week he will get it. That ends our show. K-Tank’s Take: It’s clear that even though this was taped before the superstar shakeup, the writing was on the wall for Sanity/Dain and Almas with Vega. Easy way to write those two off the show. Black got a great reaction, which was good to see. I read a comment from Dave Meltzer who said he feels Black’s lost a lot of steam since he started talking. I don’t agree with that at all. I still think he’s the best thing going on NXT, and that’s no slight to the Gargano’s, Cole’s and Ricochet’s of the brand. Do any of you feel this way about Black? Sound off in the comments because I was really surprised to see someone say that. That’s it for this week so until next time, don’t do anything I wouldn’t do… but if you do, name it after me!